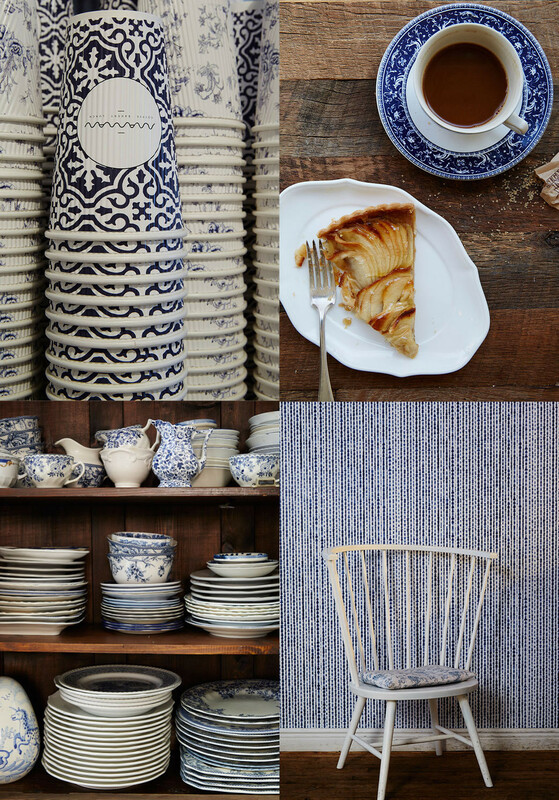 Salvaged materials and eye-catching patterns are used judiciously throughout Maman's welcoming interior. Maman’s love story starts, in true cosmopolitan fashion, at a bar in Montreal: Benjamin Sormonte, a French lawyer, walks up to Elisa Marshall, a Toronto native and event planner. He tells her he’s a French actor; they exchange numbers, and a couple of days later, “I get a very apologetic phone call, explaining that it was all a lie,” Marshall says. 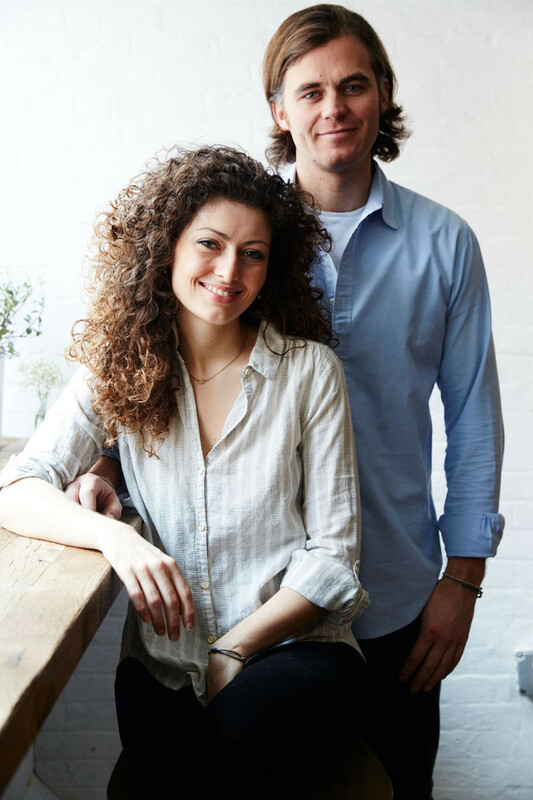 Elisa Marshall and Benjamin Sormonte at their café. A vintage fan and mixers turned pendant lights help set the mood. 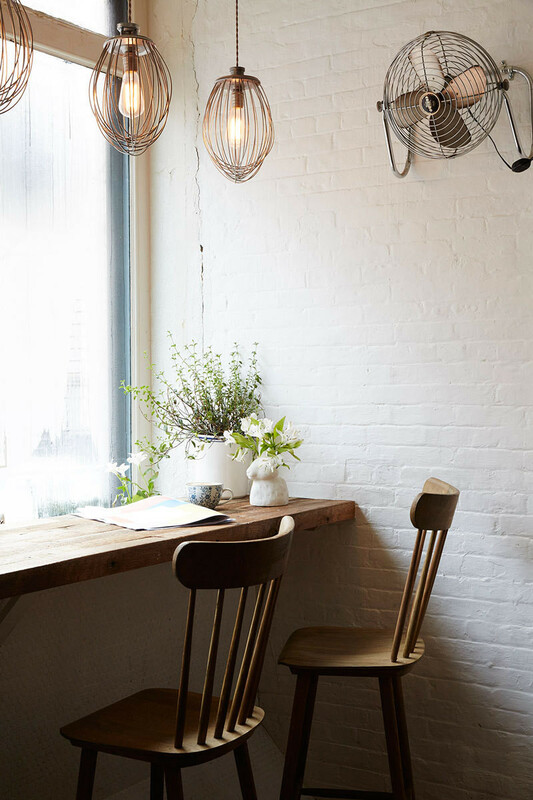 A 1,300-square-foot former machinery shop on the fringes of SoHo turned out to be the ideal spot, with its tin ceilings, exposed brick walls, and pockmarked floors. “Other places had completely new floors and walls, but this original floor dates back to the 1920s—it adds so much character,” Marshall says. Fairy lights twinkle in the dining room; a large factory window (transported from Toronto) allows diners to observe the baking process, helmed by Michelin-starred chef Armand Arnal. For seating, the owners assembled a variety of secondhand chairs and brought in pieces from their own home (Marshall’s father just so happens to be an antiques dealer, after all). 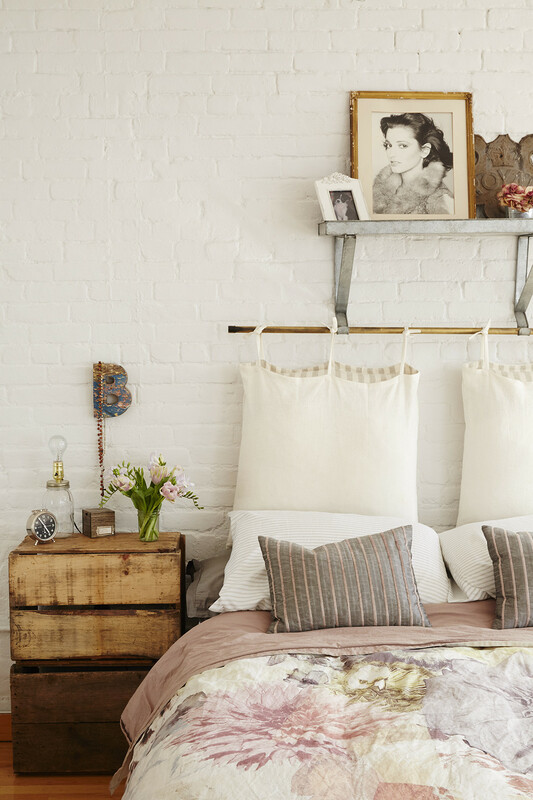 Maman’s look is all about embracing texture, from tin ceilings to exposed brick. The philosophy also applies to the bathroom, where multiple family photos are displayed in a hodgepodge of frames. “It’s an eclectic mixture, but we kept the continuity by having all black-and-white images,” Marshall says. 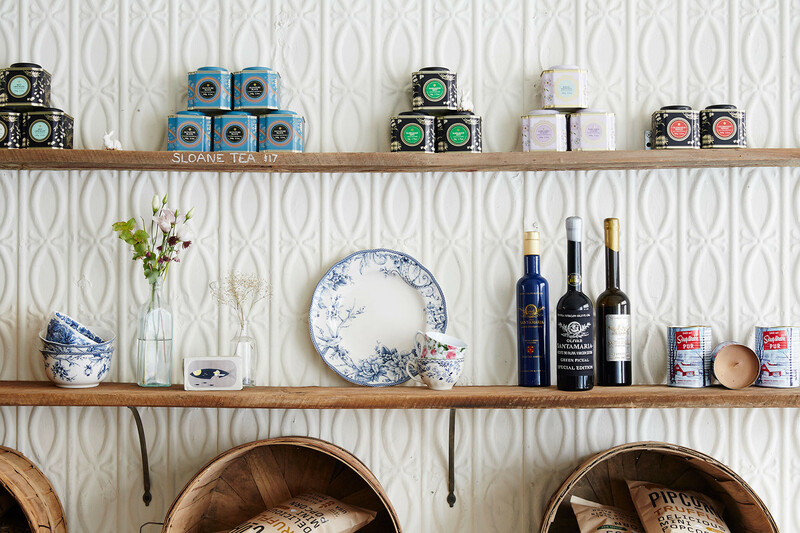 Only one of the café’s walls—a sliver adjacent to the kitchen—is covered in a bright blue-and-white design. 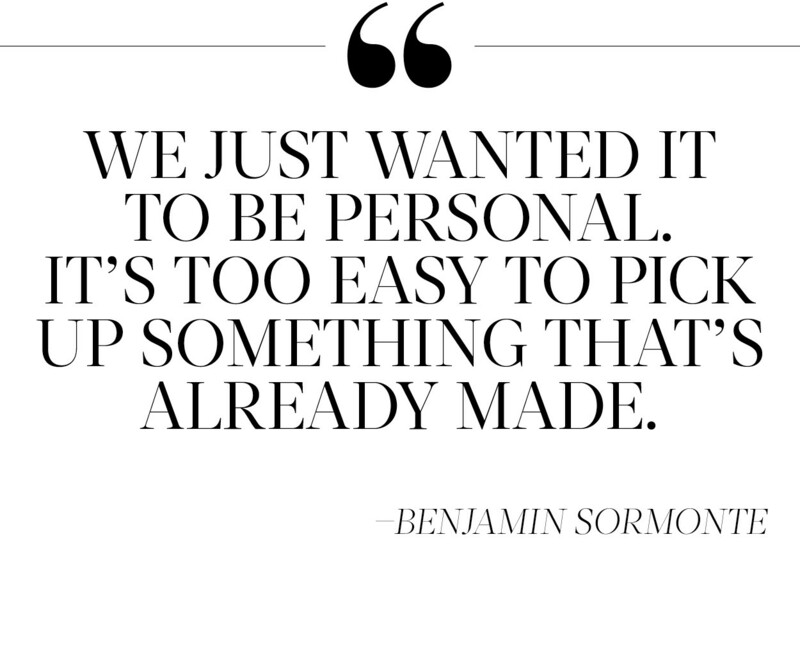 “It’s tricky when patterns are [too] close together,” Sormonte says. “It can become very distracting.” A single intricate accent wall remains in visual harmony with the brick-and-white interior. 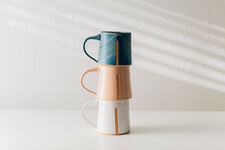 Perhaps our favorite design element of Maman: the four exclusive textile prints created by a close friend of the couple’s, Candice Kaye, and used on the seat cushions and coffee cups. A lighter toile pays tribute to Sormonte’s heritage, a rose-and-peony print integrates their mothers’ favorite flowers, a bold striped pattern represents classic Americana, and a complex mosaic harks back to the couple’s time in Ibiza. The unique nature of every piece is what makes Maman feel less corporate, more mom-and-pop. Chairs are of different sizes, silverware is eclectic, and “we have some chips in our plates, and [the plates] definitely don’t match,” Marshall says. What’s more important: backstory. 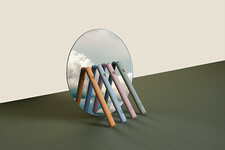 A set of china comes from Sormonte’s grandmother, while a child’s high chair belonged to Marshall’s father in the 1940s. 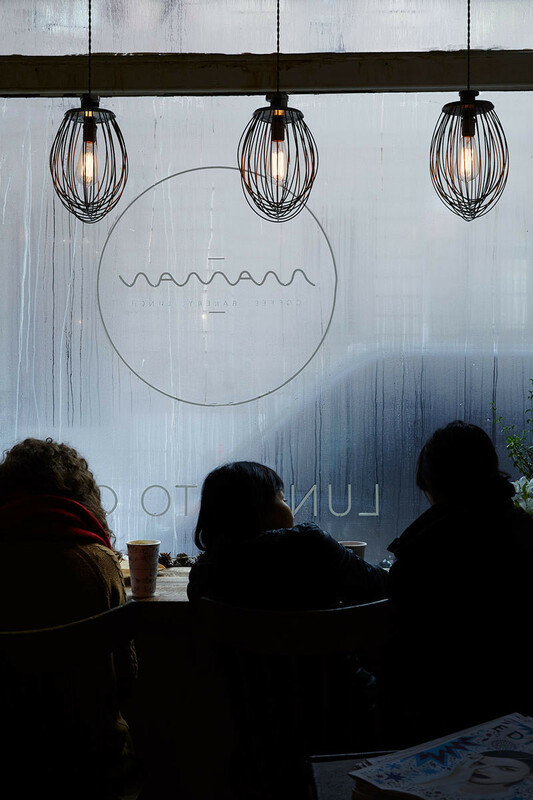 The café seems made for rainy afternoons. Leafy plants tower over tables with mismatched chairs. “Everything we own has to be beautiful and useful,” Marshall says, so the two drew from their vast collection of bunny decorations, brought in their bedside tables as storage bins, and turned an heirloom mirror into a menu board. A carpenter in the South of France was commissioned to create several key elements. “He did the tables, the hutch, the traditional church bench that’s up front, and sanded down a 1929 bread machine and put our logo on it,” Sormonte says. Vintage apple crates were reinvented as bread baskets. Retro mixers and colanders were transformed into hanging lights. And framed family photos are proudly displayed. 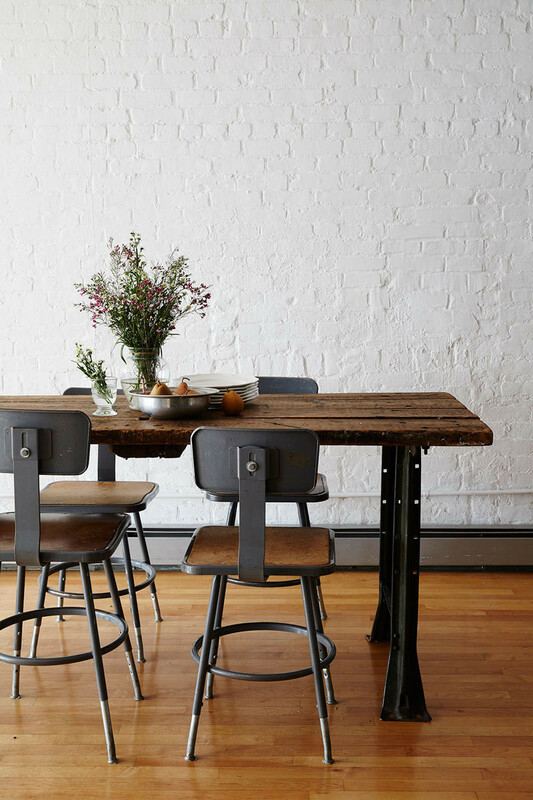 The industrial vibe is softened by informal floral arrangements and whimsical motifs. A portrait of Marshall's photogenic mother draws the eye above the couple's bed. In fact, the entire apartment is an ode to functional charm. Wire pendant lights, crafted from cords found online and flea-market discoveries in Ibiza, were assembled by Marshall herself. 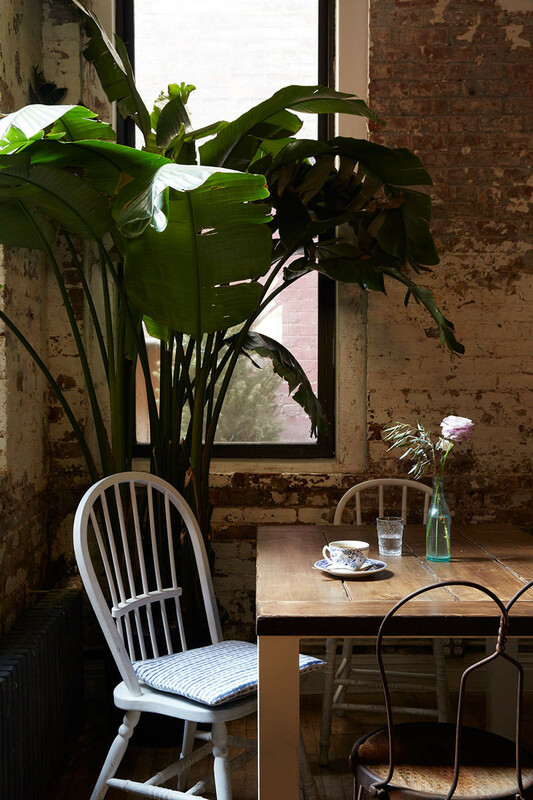 A workman’s desk from Brooklyn Flea acts as a dining table, and hanging plants and tiny animal heads from Anthropologie bring a bit of the country into the city. “We both love cute and quirky things,” Marshall says. The ever-present bunny collection is testament to the couple's love for personality-laden secondhand finds.